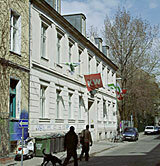 From April 20 until June 20, 2001, the 2nd berlin biennale presents works by 49 artists from 31 countries. On our Tour of the exhibition, we illustrate works by 30 participants in the form of a photo-reportage. With help of the links in the complete list of artists you can gain a quick overview of who appears in our tour. 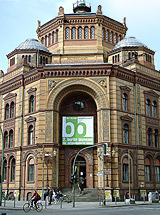 Whereas the 1st berlin biennale (1998) concentrated on Berlin, both in regards to theme as well as participants, the 2nd edition is considerably more open. The Dutch curator Saskia Bos selected more international artists, and explicitly strove to bring new viewpoints to the city. "Saskia Bos ... orients herself toward the keywords 'connectedness', 'commitment', and 'contribution', which refer to a turning away from self-referential, egocentric approaches in art. In contrast to numerous positions from the 60's and 70's, this exhibition is not about overall societal changes, but rather about 'one to one relationships, about small feasible utopias' (Saskia Bos). For the participating artists, it is 'more important to make reference to something than to express something'. Many of the artists deal critically or humorously with the art system as well." 29 May - 3 August 2014. Curator: Juan A. Gaitán. Artistic Team: Tarek Atoui, Natasha Ginwala, Mariana Munguía, Olaf Nicolai, Danh Vo. 27 April - 1 July 2012. Curator: Artur Żmijewski. Associate Curators: Voina, Joanna Warsza. 5 April - 15 June 2008. Preview information. Photo essay on the radical changes in the city over the 1990s. Photos: Ulrich Wüst. Curatorial concept, realization: Pat Binder & Gerhard Haupt. Text: Matthias Flügge. Published online 1999.